Today’s GTV episode is available for you to watch on YouTube. If you want to keep up to date on news, information, and sports subscribe to the channel and press the notifications button. The Unified Flag Football team competes in Sectional play this Saturday at 2:00 p.m. at Warsaw HS. Please note the time change from 10:00 a.m. to 2:00 p.m. Warsaw HS also wants fans to be reminded that the IHSAA sets the admission price for these events and there will be a $5 admission charge for K-Adults. 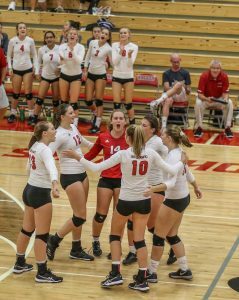 The RedHawks play Wawasee HS in round 1, and if we win the first game, we will play in the championship shortly after game 1. 2018 Homecoming week is here! Spirit days are THIS week! There are prizes for the best dressed each day. Judging is during lunch so stop by the student council table and have your photo snapped in order to win. Homecoming Bonfire: Join us after the game TONIGHT until 11:30 p.m. for a night of fun, music, and memories! We will be in the grassy lot across from the soccer practice field next to the band practice lot. This is open to all GHS students. Please bring chairs or blankets and ingredients for s’mores. Do you want to win money for college? College Go Week is THIS week, and we would like to give students a chance to win a $529 scholarship from Learn More Indiana. The scholarship is open to anyone in grades 9-12, and one student from each grade state-wide will win the award! You can be creative and draw a picture, digital image, take a photo, or write an essay about a career that you are interested in. Please stop by the Guidance Office and speak to Mrs.Villalobos to pick up an entry form if you are interested. All entries are due by Friday, October 19th. IUSB will be in the Guidance office for on-site admissions on Monday, October 1st from 9:00 a.m. until noon. Come to Guidance and sign up for a time slot and a paper application to fill out prior to October 1st, and you will know if you have been accepted at your meeting. IUSB will also be giving a $500 scholarship to any student that has a 3.0 or higher GPA. This scholarship will only be available on October 1st. Purdue University Fort Wayne (IPFW) will be in the guidance office on Tuesday, October 2nd from 11:30 a.m.-3:30 p.m. Their admissions office has discontinued paper applications. We encourage students to apply during the last week of September, if at all possible. The $30 application fee will be automatically be waived THAT WEEK ONLY. The application process is streamlined and takes about 20-30 minutes to complete. There are no essay questions for students to worry about. Students should bring their official high school transcript to their scheduled meeting. Attention Students: Herff Jones will be here again on Tuesday, October 2nd before school to take class ring orders for any grade, and for senior orders for caps and gowns, graduation announcements, and other senior items. Extra packets are available in the main office. Attention GHS Students: FCA or FCS (Fellowship of Christian Athletes/Students) will meet on Wednesday, October 3rd at 7:30 a.m. If you are looking to fellowship with other Goshen students and athletes, FCA is for you. This club helps students and athletes inject their faith into daily routines. This year our meetings will be held on the first and third Wednesday of the month. We will meet in Mr. Hutcherson’s room. Anyone is welcome – you don’t have to be an athlete. Activities range from videos, guest speakers, community projects, and even lessons given by the FCA leaders. This club can often be the support a student needs in order to navigate the extremely tough waters of the high school experience and highly competitive expectations of a sport. In order to be able to vote in this year’s election you must have a valid Indiana Driver’s License or Indiana State ID Card, be a citizen of the United States, be at least 18 years old on or before November 6th, 2018, have lived in your current precinct for at least 30 days, and not currently be in prison after being convicted of a crime. Go to https://indianavoters.in.gov/ to register online. The deadline to register is Tuesday, October 9th. BE A PART OF IT ALL! The Interra Credit Union RedHawks Branch is open! Located in the commons, the kiosk is in operation from 12:00-2:00 p.m. on Wednesdays and Fridays. Students, faculty, and staff – stop by to learn about the services available to you and to meet Martha and Tricia. Plan to participate in this year’s Grand Opening celebration NEXT week, when you can register to win door prizes and spin the WHEEL OF SUPRISES! Do you need to catch up on credits or just want to get ahead? Merit on the Move may be for you! Students can earn credits in nearly any subject in order to get a better grade, get a class or two out of the way early, or even graduate early. Sessions run Wednesdays and Thursdays after school from 3:45-5:45 p.m. starting THIS week. Talk to your counselor for more information. IB registration forms should be completed and returned to Mrs. Haney in the main office. You do not have to pay in full when you turn in the form. If you have questions, please see Mr. Nichols or Mrs. Collins. GHS has formed a Robotics team to participate in the FIRST tech Challenge which competes at the state, national, and world level in robotics. We our looking for more students interested in being part of this team. All skill levels are welcomed and needed – technical and non-technical. Our team needs all kinds of skills to succeed. Student and adult team members are encouraged to bring any skills they already have, like programming, electronics, metalworking, graphic design, web creation, public speaking, videography, and many more. FIRST Tech Challenge welcomes every student, with or without special skills. If you want to be part of the team, see Mr. Moist in room 1311 or e-mail him at kmoist@staff.goshenschools.org. To know more about the program go to the FIRST Tech Challenge info page. You are under no circumstances allowed to lock your bike up to any fence or gate on school property. There has been a problem with students specifically doing this along the fence/gate to the soccer fields. If you continue to do this, your lock will be cut, and your bike will be removed. There are bike racks available, and they should be used. Thank you for your cooperation with this! German Club will meet on Tuesday, October 2nd during the 2nd session of SRT in the Main Gym. We will be doing our graffiti activity, picking a t-Shirt design, and electing officers. Do you enjoy engineering competitions, figuring out how things work, solving problems, or designing new things? If so, then come check out TSA (Technology Student Association) during the 2nd session of SRT on Thursday, October 4th in Lab 8040! Come hear what TSA is all about and the opportunities available. See Mrs. Yoder with any questions. Multicultural Youth Dance Club (MYD) will have a call out meeting on Tuesday, October 9th during the 2nd session of SRT in Whiteman Gym. GHS is starting up an ESports Club for this year! There will be a call out meeting Tuesday, October 9th during the 2nd session of SRT in the Main Gym. The club will be using League of Legends, Defense of the Ancients 2, or Heroes of the Storm initially to develop the club with a chance to grow into more platforms. So if you have an interest in ESports, want to learn how to play ESport games, or want to increase your own skills come check it out. If you have any questions please contact Mr. Perry at mperry@goshenschools.org. 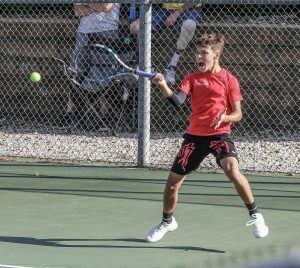 The boy’s tennis team’s season ended Thursday night with a tough 4-1 loss to NorthWood in the sectional semifinals. The team finishes the season 17-4. Seniors Drake Crowder and Axel Brown scored the lone point for the RedHawks. The Goshen girls’ soccer team hosted their final regular season game of the season last night versus West Noble. Goshen honored their seniors with a strong 7-0 win over the Chargers. Alexa Medina had a hat trick to lead the offense on her senior night. Aniya Hartzler scored two goals and Joselyn Guevara and Joya Drenth also scored for the RedHawks. Regan Mast, Alexa Medina, & Alexia Reina assisted on the goals. Goshen honored 11 seniors on this special night: Madison Rittenhouse, Alexia Reina, Monse Urzua, Joselyn Guevara, Alexa Medina, Aniya Hartzler, Lexi Flores, Maggie Gallagher, Megan Bullock, Kyrah Fletcher, and Janette Olvera. Thanks to everyone who came out and supported the girls. The Varsity girls finish the year with a 7-9 record. The JV team defeated West Noble 3-0. Alessandra Lozano had 2 goals and Maddie Swallow one to lead the Goshen offense. Leslie Mendoza assisted on the goals. The Goshen JV team finished their regular season with a 9-3-2 record. The Goshen RedHawks Varsity Volleyball team fell to NLC foe Plymouth 0-3. Boys varsity tennis sectional finals are at Northwood at 4:30 p.m. Boys varsity football will host Northridge at 7:00 p.m.
Goshen will compete in the Unified Flag Football Sectional at Warsaw Community High School at 2:00 p.m. GHS will be competing against Wawasee in the semifinal game. If GHS wins against Wawasee, then they will play in the championship game that will be played 30 minutes after the conclusion of the semifinal round. Ticket gates open at 1:00 p.m. and the cost of admission is $5. Girls varsity volleyball will travel to Southwood High School to compete in the Southwood Tournament at 9:00 a.m. Girls JV soccer will compete in the Plymouth Invitational at 9:00 a.m. Boys and girls JV & varsity cross country will run in the NLC Championship at Ox Bow Park at 9:00 a.m. Boys JV football will play at Northridge at 10:00 a.m.
Senior Night and GHS Student Fan Appreciation Night are TONIGHT for volleyball and girls soccer. Come out and support your classmates as volleyball plays Plymouth and girls soccer plays West Noble. All GHS students in attendance with an ID can receive two free slices of pizza as a thank you for your support this fall. This will be distributed between the 1st and 2nd games at varsity volleyball and after the halftime senior night ceremony at girls soccer. Go Big Red! Homecoming Court: This year’s homecoming court was selected by coaches, club sponsors, and teachers. Students who are considered leaders on the playing field, in the classroom, and around school were selected. Voting concludes TODAY. Look for the email from Mrs. Stealy, and make sure to click on the link to vote! Homecoming Bonfire: Join us after the game TOMORROW until 11:30 p.m. for a night of fun, music, and memories! We will be in the grassy lot across from the soccer practice field next to the band practice lot. This is open to all GHS students. Please bring chairs or blankets and ingredients for s’mores. Attention any boy interested in wrestling this year – We will have a meeting TODAY during the 2nd session of SRT in the main gym. If you plan on wrestling, plan on attending. If you are unable to attend please contact Coach Pickard before the meeting. Student Council will meet TODAY during the 2nd session of SRT in the auditorium. Student council is a student lead group that represents the opinions of the student body. They encourage school spirit, as well as work with the faculty and administration of the school to ensure that student voices are heard. It’s not too late to join! At our next meeting we will be discussing fundraiser ideas, class sponsored events, outlining events for the year, and finalizing homecoming activities. If you have any questions, please contact Mrs. Walters, student council sponsor, at awalters@staff.goshenschools.org. The boys tennis team won the 1st round Sectional match 5-0 over Bethany. Drake Crowder and Axel Brown bounced back from losing the 1st set to win the next two sets. Carlos Lichty and Ryan Harmelink each won 1st set tiebreakers and Carlos fought off five set points. Ryan’s points lasted so long that Drake and Axel finished two games during one of Ryan’s POINTS! Boys varsity tennis will compete in sectional semifinals at Northwood at 4:30 p.m. Girls freshman volleyball will travel to Plymouth to play against Plymouth and Tippy Valley at 5:00 p.m. Girls soccer will host West Noble. JV plays at 5:30 p.m., followed by varsity at 7:15 p.m. Girls volleyball will host Plymouth. JV plays at 5:30 p.m., followed by varsity at 7:00 p.m.
BE A PART OF IT ALL! The Interra Credit Union RedHawks Branch opens TODAY! Located in the commons, the kiosk is in operation from 12:00-2:00 p.m. on Wednesdays and Fridays. Students, faculty, and staff – stop by to learn about the services available to you and to meet Martha and Tricia. Plan to participate in this year’s Grand Opening celebration next week, when you can register to win door prizes and spin the WHEEL OF SUPRISES! Senior Night and GHS Student Fan Appreciation Night are TOMORROW for volleyball and girls soccer. Come out and support your classmates as volleyball plays Plymouth and girls soccer plays West Noble. All GHS students in attendance with an ID can receive two free slices of pizza as a thank you for your support this fall. This will be distributed between the 1st and 2nd games at varsity volleyball and after the halftime senior night ceremony at girls soccer. Go Big Red! Homecoming Bonfire-Join us after the game for a night of fun, music, and memories! When: Friday, September 28th after the football game until 11:30 p.m.
Homecoming Court: This year’s homecoming court was selected by coaches, club sponsors, and teachers. Students who are considered leaders on the playing field, in the classroom, and around school were selected. Voting concludes TOMORROW. Look for the email from Mrs. Stealy, and make sure to click on the link to vote! The 2018 “Volley for a Cure” breast cancer awareness fundraiser night will take place on Tuesday, October 2nd when the Goshen volleyball team competes at Bethany Christian. “Volley for a Cure” t-shirts are available for $15 (sizes Y XL, A S-XXL). If you would like to purchase a shirt, please stop in and see Jan Schrock in the Athletic Office THIS week. $6 from each t-shirt sale will go to Goshen Health’s Center for Cancer Care. Attention any boy interested in wrestling this year – We will have a meeting TOMORROW during the 2nd session of SRT in the main gym. If you plan on wrestling, plan on attending. If you are unable to attend please contact Coach Pickard BEFORE tomorrow. Student Council will meet TOMORROW during the 2nd session of SRT in the auditorium. Student council is a student lead group that represents the opinions of the student body. They encourage school spirit, as well as work with the faculty and administration of the school to ensure that student voices are heard. It’s not too late to join! At our next meeting we will be discussing fundraiser ideas, class sponsored events, outlining events for the year, and finalizing homecoming activities. If you have any questions, please contact Mrs. Walters, student council sponsor, at awalters@staff.goshenschools.org. The girls soccer team lost a close battle with Concord last night 2-1. Aniya Hartzler scored for Goshen on an assist from Regan Mast. Madison Rittenhouse had eight saves in goal for the RedHawks. The JV girls defeated Concord 4-0. Maddie Swallow had a hat trick to lead the Goshen offense. Priscilla Ramirez also scored for the RedHawks. Alex Lozano, Diana Cortez, and Lucy Kramer assisted on the goals. Boys varsity tennis will compete in the first round of sectionals at Northwood at 4:30 p.m. Good luck gentlemen! 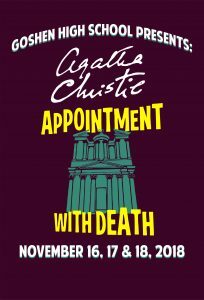 Goshen High School students and directors are putting the finishing touches on the GHS Fall Play, Agatha Christie’s Appointment with Death. This will be good, and we know that you won’t want to miss it! Show times and ticket prices are listed below. Friday and Saturday, November 16 & 17 at 7:30 p.m. and Sunday, November 18 at 2:00 p.m.
Tickets will be available at the door. The cost of tickets: Adults:$ 8.00, Students/Seniors (65+)= $5.00, and Families: $20.00. If you have questions, you may call Goshen High School at 574-533-8651. Senior Night and GHS Student Fan Appreciation Night are this Thursday for volleyball and girls soccer. Come out and support your classmates as volleyball plays Plymouth and girls soccer plays West Noble. All GHS students in attendance with an ID can receive two free slices of pizza as a thank you for your support this fall. This will be distributed between the 1st and 2nd games at varsity volleyball and after the halftime senior night ceremony at girls soccer. Go Big Red! 2018 Homecoming week is here! Spirit days start TODAY. There are prizes for the best dressed each day. Judging is during lunch so stop by the student council table and have your photo snapped in order to win. Homecoming Court: This year’s homecoming court was selected by coaches, club sponsors, and teachers. Students who are considered leaders on the playing field, in the classroom, and around school were selected. Voting begins TODAY and concludes Thursday, September 26th. Look for an email from Mrs. Stealy, and make sure to vote! Multicultural Youth Alliance (MYA) will have a call out meeting TODAY during the 2nd session of SRT in Whiteman Gym. French Club: We have a very special meeting this month! Come to room 2410 TODAY for both sessions of SRT. We will be going outside for a picnic and to play pétanque, a traditional lawn game played in France. We will spend the first 15 minutes of 1st session learning how to play the game and watching some videos. Then, we will head outside (weather permitting). Hope to see you all there! There will be a Spell Bowl meeting TODAY during the 2nd session of SRT in room 2100. Anyone who is interested is welcome to attend! Attention any boy interested in wrestling this year – We will have a meeting on Thursday during the 2nd session of SRT in the main gym. If you plan on wrestling, plan on attending. If you are unable to attend please contact Coach Pickard BEFORE Thursday. Student Council will meet Thursday, September 27th during the 2nd session of SRT in the auditorium. Student council is a student lead group that represents the opinions of the student body. They encourage school spirit, as well as work with the faculty and administration of the school to ensure that student voices are heard. It’s not too late to join! At our next meeting we will be discussing fundraiser ideas, class sponsored events, outlining events for the year, and finalizing homecoming activities. The Goshen Unified RedHawks hosted the Tippecanoe Valley Vikings for their first unified flag football game at Foreman Field. The Vikings came out on top with some great work by their offense runs including a pass for a touchdown that flew for the full length of the field. The RedHawks had some outstanding players as well with Lexi Tucker scoring both touchdowns including one where she literally ran right out of her shoe! Tucker ran faster and harder than she has all season and her hard work has shown. Interceptions were caught by GHS defense players Austin Peeler and Kobe Gritzmaker. The Unified RedHawks play Wawasee next in their sectional match in Warsaw on Saturday at 10:00 a.m. The boys varsity soccer team hosted the Penn Kingsmen, and ended up with a 1-1 tie. Goals: Fernando Quevedo. Assists: Emylio Romo. The tie brings Goshen’s overall record to 10-3-3 overall, and 3-2-2 in the NLC. Girls soccer will travel to Concord. JV plays at 5:00 p.m., followed by varsity at 6:45 p.m. Good luck ladies! 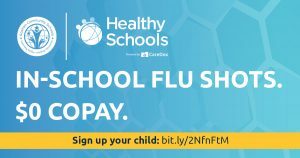 FLU SHOTS SAVE LIVES, Sign up your child for a no-cost, in-school flu shot. Your copay is $0 when you fully complete registration. Sign up online or by returning the attached form to your school. Flu shots reduce your family’s flu risk— especially babies and grandparents. Every flu shot administration decreases your community’s risk of flu. NOTE: If your child is under age 4 and cannot receive the No Cost Flu vaccine at school it is recommended that your child visit his/her doctor or local Health Department to receive this vaccine. LAS VACUNAS CONTRA LA GRIPE SON LA PROTECCIÓN MAS SEGURA Inscriba a su hijo/a en la clínica de gripe de su escuela sin costo. Su copago es del $0 al completar la registración. Las clínicas se llevan a cabo durante el día escolar, por lo cual usted no tendrá que faltar al trabajo. devuelva el formulario adjunto a su escuela. Una vacuna contra la gripe es el mejor escudo de su hijo contra la gripe. La vacuna contra la gripe reduce el riesgo de gripe de su familia, especialmente bebés y personas mayores. Cada vacuna contra la gripe disminuye el riesgo de gripe de su comunidad. NOTA: Si su hijo es menor de 4 años y no puede recibir la vacuna contra la gripe sin costo en la escuela, se recomienda que su hijo visite a su médico o al Departamento de Salud local para recibir esta vacuna. How does $1 million sound? Pretty good, right? Did you know that someone with a college degree will earn, on average, $1 million more over a lifetime than someone with just a high school diploma? It’s never too early to start planning for education beyond high school. Visit LearnMoreIndiana.org/college to get tips on what you can be doing each year of high school, and keep an eye out for College GO! events happening all week long at school. Seniors: Do you want/need help applying for colleges? Mrs. Villalobos will be booking the conference room NEXT Tuesday and Thursday during SRT in the guidance office to do just that. Attached below is a worksheet you should read carefully and fill out beforehand. It does not all need to be completed, but the more you have the easier it will be to fill out the application. Come prepared. If you are not, our time will be wasted! Congratulations to the Crimson Marching Band for placing 2nd out of 20 bands at the Penn Carnival of Bands this past Saturday! The band will perform at the Bands of America Regional Competition this weekend at Bowling Green State University. Good luck to all of you! 2018 Homecoming week is here! Spirit days start TOMORROW. There are prizes for the best dressed each day. Judging is during lunch so stop by the student council table and have your photo snapped in order to win. Homecoming Court: This year’s homecoming court was selected by coaches, club sponsors, and teachers. Students who are considered leaders on the playing field, in the classroom, and around school were selected. Voting begins TOMORROW and concludes Thursday, September 26th. Look for an email from Mrs. Stealy TOMORROW morning and make sure to vote! Multicultural Youth Alliance (MYA) will have a call out meeting TOMORROW during the 2nd session of SRT in Whiteman Gym. French Club: We have a very special meeting this month! Come to room 2410 TOMORROW for both sessions of SRT. We will be going outside for a picnic and to play pétanque, a traditional lawn game played in France. We will spend the first 15 minutes of 1st session learning how to play the game and watching some videos. Then, we will head outside (weather permitting). Hope to see you all there! There will be a Spell Bowl meeting TOMORROW during the 2nd session of SRT in room 2100. Anyone who is interested is welcome to attend! Boys varsity football took on the Warsaw Tigers at Warsaw High School. The RedHawks lost to the Tigers 35-0. Offensively for the RedHawks, Wesley VanHooser led all receivers with 43 yards receiving. Bryant Grewe led the way for the rushing attack. The RedHawks were led defensively by Daveyon Sanford. He had 13 tackles and one for loss of yards. Bryant Grewe, Drew Marlow, and Dominic Sosa each had eleven tackles as well. Boys JV football took on the Warsaw Tigers, losing 50-0. Offensively, the RedHawks were led by Mitch Daniels. He led the way rushing the football. On the defensive side of the ball, the RedHawks were led by Isaac Sawatzky and Roman Schrock. Both had fumble recoveries. Steve Sanders also forced a fumble. The boys varsity tennis team finished the year #2 in the Northern Lakes Conference. Ryan Harmelink finished 4th at 1 Singles and was selected to the Honorable Mention All-Conference team. Wes Beck finished 3rd at 2 Singles. Carlos Lichty was champion and all-conference at 3 Singles. Diego Torres and Ben Bontrager-Singer finished 4th at 1 Doubles. Drake Crowder and Axel Brown finished 5th at 2 Doubles. Girls soccer hosted two state ranked opponents on Saturday. In the morning game the girls lost to Fort Wayne Carroll 2-0. Madison Rittenhouse had ten saves for the RedHawks. In the afternoon game Goshen lost to Homestead 6-1. Hailey Mast scored Goshen’s only goal on an assists from Lesly Arellano. The Goshen girls are now 6-8 on the season. The JV girls also played two matches on Saturday. The JV lost to Carroll 3-0 and Homestead 5-0. The JV record is now 8-3-2 for the season. Boys varsity soccer traveled to Ft. Wayne to play against the Fort Wayne Carroll Chargers and won by a score of 3-1. Goals: Ciro Aguilar (2) and Saulo Luna (1). Assists: Saulo Luna (1) and Ciro Aguilar (1). The win brings the boys varsity soccer team’s overall record to 9-3-2, and 3-2-2 in the NLC. They also played at Homestead, and came away with the victory by a score of 1-0. Goals: Ciro Aguilar (1). Assists: Saulo Luna and Ricardo Vargas. The win brings the boys varsity soccer team’s overall record to 10-3-2 and 3-2-2 in the NLC. Boys JV soccer was defeated by Carroll 1-2. Goshen goal scorers: Johan Martinez. Goshen’s record is now 9-2-3 and their conference record is 4-1-2. They defeated Homestead 2-1. Goshen goal scorers: Carlos Casteneda and Armando Ortega. Goshen assists: Fernando Salazar. The girls cross country team finished 13th at the New Haven Classic Invitational. Yadira Sanchez led the team placing 57th followed by Kassidy Bestul 79th, Kayleigh McKee 96th, Sophia Koshmider 105th, Julie Walton Clark 106th, Brandi Smith 113th, and Flor Rangel 125th. The boys cross country team finished 10th at the New Haven Classic Invitational. Felix Perez Diener led the team placing 6th followed by Jonathon Snyder 43rd, Angel Arreola 51st, Adrian Mora 83rd, Cole Johnston 85th, Sam Miller 103rd, and Ryan Diaz 106th. Boys soccer will host Penn. JV plays at 5:00 p.m., followed by varsity at 6:45 p.m. The RedHawks unified flag football team hosts Tippy Valley at Foreman Field at 5:30 p.m. There is no cost for admission, but we will be collecting donations at the gate for Special Olympics Indiana. Plan to attend and support the amazing work these athletes have put in! Both teams (Concord and Goshen) displayed a level of sportsmanship during this contest. I was a line-official and all the athletes were top-class! I was impressed with the Concord team as they kept battling through the entire game. Goshen kept pushing hard and if a call did not go their way, they showed no emotion, they just huddled up and moved on. Coach Hale from Concord was very classy. I was impressed with both Elizabeth and Sophia Kirkton from Goshen High School. They took “coaching” and displayed a humble class. The entire Concord team kept working hard and Coach Hale kept coaching despite the score – I can say – I never knew the score by looking at the Concord team – they just kept playing and working. Way to go GHS volleyball and Coach Howard! You’ve got game, but you’ve also been recognized for your classy representation of Goshen Community Schools. Well done! Current juniors and seniors interested in a teaching career: Marian University will be here on Monday, September 24th to talk with students regarding exciting opportunities for education majors. If you are interested in teaching, this might be a great opportunity for you! Please stop by the Guidance Office to sign up by TODAY! Do you want to win money for college? College Go Week is coming up NEXT week, and we would like to give students a chance to win a $529 scholarship from Learn More Indiana. The scholarship is open to anyone in grades 9-12, and one student from each grade state-wide will win the award! You can be creative and draw a picture, digital image, take a photo, or write an essay about a career that you are interested in. Please stop by the Guidance Office and speak to Mrs.Villalobos to pick up an entry form if you are interested. All entries are due by Friday, October 19th. Do you need to catch up on credits or just want to get ahead? Merit on the Move may be for you! Students can earn credits in nearly any subject in order to get a better grade, get a class or two out of the way early, or even graduate early. Sessions run Wednesdays and Thursdays after school from 3:45-5:45 p.m. starting NEXT week. Talk to your counselor for more information. The Crimson Marching Band will be in competition this weekend at the Penn Carnival of Bands. The group will perform at 8:13 p.m. at Penn High School. Tickets can be purchased in the band office if you are interested in attending. HELP WANTED: Burger King is hiring! If you are interested, please visit www.bk.com/careers/apply for more information. Multicultural Youth Alliance (MYA) will have a call out meeting on Tuesday, September 25th during the 2nd session of SRT in Whiteman Gym. French Club: We have a very special meeting this month! Come to room 2410 for BOTH SESSIONS of SRT on Tuesday, September 25th. We will be going outside for a picnic and to play pétanque, a traditional lawn game played in France. We will spend the first 15 minutes of 1st session learning how to play the game and watching some videos. Then, we will head outside (weather permitting). Hope to see you all there! There will be a Spell Bowl meeting on Tuesday, September 25th during the 2nd session of SRT in room 2100. Anyone who is interested is welcome to attend! Boys varsity soccer hosted the Warsaw Tigers, and they ended up with a tie of 1-1. Goals: Ciro Aguilar (1). The tie brings Goshen’s record to 8-3-2 overall, and 3-2-2 in the NLC. Boys JV soccer lost to Warsaw 2-0. Goshen’s record is now 9-1-3, and they are 3-1-2 in conference. Boys varsity football will travel to Warsaw at 7:00 p.m. Girls varsity golf will compete in Regionals at Noble Hawk – time TBA. Boys varsity tennis will travel to Wawasee to compete in NLC finals at 9:00 a.m. Boys and girls JV & varsity cross country will travel to IPFW for the New Haven Classic at 9:00 a.m. Boys JV and varsity soccer will play at Ft. Wayne Carroll at 10:00 a.m., and then at Homestead at 2:30 p.m. Boys JV football will host Warsaw at 10:00 a.m. Girls JV and varsity soccer will host Ft. Wayne Carroll at 10:00 a.m., and then Homestead at 2:30 p.m. Girls volleyball will host Elkhart Christian Academy. JV will play at 10:00 a.m., followed by varsity at 11:30 a.m.
Current juniors and seniors interested in a teaching career: Marian University will be here on Monday, September 24th to talk with students regarding exciting opportunities for education majors. If you are interested in teaching, this might be a great opportunity for you! Please stop by the Guidance Office to sign up by TOMORROW! Do you enjoy word puzzles and games? Do you enjoy reading and writing stories that stretch the limits of your imagination? If so, Creative Writing Club is for you! Come and check out the club at our first meeting of the year TODAY during the 2nd session of SRT in room 2430. Boys varsity tennis will play in the 2nd round of the NLC Tourney at Plymouth at 4:30 p.m. Girls freshman volleyball will host Central Noble and Concord at 5:00 p.m. Boys soccer will host Warsaw. JV plays at 5:30 p.m., followed by varsity at 7:15 p.m. Girls volleyball will travel to Concord. JV will play at 5:30 p.m., followed by varsity at 7:00 p.m. Families of students in Goshen Community Schools can get discounted food and textbooks if they qualify. If you have not turned in a meal application this year, please do so as soon as possible. You can fill out the meal application online. Go to the GCS website and search for “meal application” or stop by your student’s school to pick up a paper form. Las familias de los estudiantes de la Corporación Escolar de Goshen pueden recibir descuento en comidas y libros de texto en caso de cumplir los requisitos. Si usted no ha entregado la solicitud de comidas escolares este año, por favor hágalo lo más pronto posible. Usted puede llenar la solicitud en línea. Visite el sitio Web de GCS y busque “meal application” o vaya a la escuela de su hijo por una solicitud en papel. In order to be able to vote in this year’s election you must have a valid Indiana Driver’s License or Indiana State ID Card, be a citizen of the United States, be at least 18 years old on or before November 6th, 2018, have lived in your current precinct for at least 30 days, and not currently be in prison after being convicted of a crime. Go to https://indianavoters.in.gov/ to register online. Do you enjoy word puzzles and games? Do you enjoy reading and writing stories that stretch the limits of your imagination? If so, Creative Writing Club is for you! Come and check out the club at our first meeting of the year TOMORROW during the 2nd session of SRT in room 2430. Boys varsity soccer defeated the Wawasee Warriors on Senior Night by a score of 4-1. Goals: Cruz Garcia (1), Alex Munn (1), Ciro Aguilar (1), and Ricardo Vargas (1). Assists: Saulo Luna (1), Diego Romo (1), Alex Munn (1), and Fernando Quevedo (1). The win brings Goshen’s record to 8-3-1 overall, and 3-2-1 in the NLC. The girls cross country team was defeated by Concord 44-17, and Wawasee 39-20. Yadira Sanchez led the team placing 7th, followed by Kayleigh McKee 11th, Kassidy Bestul 13th, Julie Walton Clark 18th, Brandi Smith 20th, Abigail Garcia 21st, and Sophia Koshmider 22nd. The boys cross country team defeated Wawasee 24-35, and Concord 27-32. Felix Perez Diener was the overall winner, followed by Johnathon Snyder 6th, Angel Arreola 8th, Adrian Mora 10th, Ryan Diaz 11th, Sam Miller 12th, and Cole Johnston 13th. Boys varsity tennis will play in the NLC Tourney at Plymouth at 4:30 p.m. Good luck gentlemen! Click on the District Orientation Meetings by state. Seating is limited, so please register early. 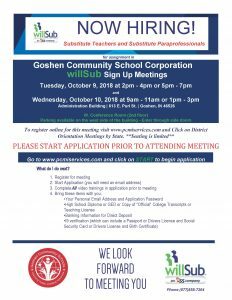 Please start an application prior to attending a meeting at GCS. Go to http://www.pcmiservices.com and click on START to begin application. If you have questions, you may call willSub at (877) 855-7264. We look forward to meeting you! The 2018 “Volley for a Cure” breast cancer awareness fundraiser night will take place on Tuesday, October 2nd when the Goshen volleyball team competes at Bethany Christian. “Volley for a Cure” t-shirts are available for $15 (sizes Y XL, A S-XXL). If you would like to purchase a shirt, please stop in and see Jan Schrock in the Athletic Office between now and Friday. $6 from each t-shirt sale will go to Goshen Health’s Center for Cancer Care. Boys and girls cross country and boys soccer will be celebrating their senior nights TONIGHT! At cross country, intros will be around 5:15 p.m., and at soccer, senior intros will be after the C game is completed at roughly 6:20 p.m. The GHS Student Athletic Council is sponsoring Fan Appreciation Night in conjunction with Senior Night and any students there to support the team on this night will get two free slices of pizza for dinner! Come on down to Shanklin Park and support the cross country team and then swing by boys soccer later to cheer on the B Soccer team on their Senior Night! Go Big Red! Stay in Bounds Ambassadors are junior and senior student-athletes who visit a 4th grade classroom six times a year to teach character principles through games and stories. All returning seniors should notify Mr. Kissinger if you are not able to participate again this year. Juniors are encouraged to see Mr. Kissinger during Monday lunches in the commons to let him know if you are interested or stop by the athletic office to leave a message. This is a time commitment of approximately 1.5 SRT periods per month, but a very rewarding experience. Please consider finding out more by attending a meeting TODAY during the 2nd session of SRT. This session is for juniors or new seniors interested. Do you enjoy word puzzles and games? Do you enjoy reading and writing stories that stretch the limits of your imagination? If so, Creative Writing Club is for you! Come and check out the club at our first meeting of the year during the 2nd session of SRT on Thursday, September 20th in room 2430. The boys varsity tennis team ended their regular season on a high note by sweeping Elkhart Memorial to finish 6-1 in the NLC and 16-3 overall. Seniors Ben Bontrager-Singer, Diego Torres, Drake Crowder, Axel Brown, and Wes Beck played strong to punctuate Senior Night. JV also won to finish the season 7-5-1. Seniors Josh Haimes, Braxton Kincaid, Anton Pham, and Zef Fransen all got wins. The conference tourney begins TOMORROW at Plymouth. The girls soccer team lost to state ranked South Bend St. Joe 6-0. Maddie Rittenhouse had ten saves in goal for the RedHawks. The varsity girls are now 6-6 on the season. The JV team lost a close game to St. Joe 2-1. Alex Lozano scored for the RedHawks. Abril Diaz had seven saves in goal for the RedHawks. The JV team is now 8-1-2 on the season. Boys soccer will host Wawasee. The C team plays at 5:00 p.m., followed by varsity at 6:45 p.m.
Volleyball will travel to Northwood. Freshmen and JV will play at 5:30 p.m., followed by varsity at 7:00 p.m. Boys and girls JV & varsity cross country will host Concord and Wawasee at Shanklin at 5:30 p.m.
Congratulations to the Crimson Marching Band for winning the Concord Invitational this past weekend! The marching band placed 1st out of 20 bands at the show and received awards for Best Visual and Best Effect. The Crimson Marching Band will be in competition this next weekend at the Penn Carnival of Bands. The group will perform at 8:13 p.m. at Penn High School. Tickets can be purchased in the band office if you are interested in attending. Tennis Senior Night is TONIGHT at the GMS courts, where the boys take on Elkhart Memorial at 5:30 p.m. Senior Night intros will be around 5:15 p.m. The GHS Student Athletic Council is sponsoring Fan Appreciation Night in conjunction with senior night and any students there to support the team on this night will get two free slices of pizza for dinner! Come out to GMS and support the tennis team TONIGHT, and then swing by girls soccer later to cheer on their team on their Staff night! Go Big Red! TOMORROW, boys and girls cross country and boys soccer will be celebrating their senior nights! At cross country, intros will be around 5:15 p.m., and at soccer, senior intros will be after the C game is completed at roughly 6:20 p.m. The GHS Student Athletic Council is sponsoring Fan Appreciation Night in conjunction with Senior Night and any students there to support the team on this night will get two free slices of pizza for dinner! Come on down to Shanklin Park and support the cross country team and then swing by boys soccer later to cheer on the B Soccer team on their Senior Night! Go Big Red! Stay in Bounds Ambassadors are junior and senior student-athletes who visit a 4th grade classroom six times a year to teach character principles through games and stories. All returning seniors should notify Mr. Kissinger if you are not able to participate again this year. Juniors are encouraged to see Mr. Kissinger during Monday lunches in the commons to let him know if you are interested or stop by the athletic office to leave a message. This is a time commitment of approximately 1.5 SRT periods per month, but a very rewarding experience. Please consider finding out more by attending a meeting TOMORROW during the 2nd session of SRT. This session is for juniors or new seniors interested. Boys varsity football took on the Concord Minutemen Friday night losing 34-9. Colin Turner had 170 yards passing. Daveyon Sanford had 135 yards receiving. Alex Ubaldo had a rushing touchdown. Ricardo Vargas had a 31 yard field goal. Leading the way for the defensive side of the ball was Drew Marlow. He had nine tackles and three of those were for losses. Bryant Grewe had a quarterback sack. The unit as a whole had five tackles for loss. Boys JV football hosted the Concord Minutemen Saturday morning losing 42-0. Leading the way offensively for the RedHawks was Eddy Flores. He had 40 yards rushing. Mitch Daniels completed two passes. Leading the way for the RedHawks defensively was Clayton Gibson. He had multiple tackles. Isaiah Park had a tackle for loss as well. Boys varsity tennis went 1-1 at the LaPorte Invitational on Saturday, dropping a 2-3 decision to South Bend Adams in the 1st round before sweeping Lowell 5-0 in the 2nd round to finish 3rd. Ben Bontrager-Singer and Diego Torres went 2-0 at 1 Doubles while Axel Brown and Wyatt Fisher went 2-0 at 2 Doubles. JV boys tennis finished 4th at the Wawasee Invite on Saturday. Braxton Kincaid and Josh Haimes were the top finishers for the team, coming in 3rd at 1 Doubles. Anton Pham, Zef Fransen, and Don Perry all went 2-1 on the day. Boys JV soccer defeated Plymouth in the 1st round of the JV tournament 6-2. Goshen Goal scorers: Armondo Ortega, Moises Gutierrez, and Isaac Daniels (4). Goshen Assists: Isaac Daniels and Carlos Castaneda (3). In the other flight A 1st round game, Northwood defeated Wawasee. In the flight A final game Goshen defeated Northwood 2-0. Goshen Goal scorers: Manith Kamalakanth and Johan Martinez. Goshen Assists: Isaac Daniels. In the flight B 1st round games: Northridge beat Concord and Warsaw beat Memorial. In the flight B final game Warsaw beat Northridge. The girls cross country team finished 15th out of the 23 team field. Yadira Sanchez led the team finishing 56th followed by Kassidy Bestul 82nd, Sophia Koshmider 106th, Brandi Smith 116th, Abigail Garcia 134th, Morgan Chupp 139th, and Julie Walton Clark 141st. The boys cross country team finished 4th out of the 24 team field. Felix Perez Diener led the team finishing 5th followed by Johnathon Snyder 37th, Angel Arreola 42nd, Adrian Mora 50th, Cole Johnston 52nd, Ryan Diaz 74th, and Sam Miller 85th. Girls varsity golf shot their best score in two years Saturday at Cobblestone. With a team score of 414, the RedHawks finished in 9th place and had many season bests by the varsity team. The Unified RedHawks Flag Football team travels to Wawasee for our season opener against both Wawasee and Warsaw at 5:00 p.m. Girls soccer will host South Bend St. Joe. JV plays at 5:00 p.m., followed by varsity at 6:45 p.m. Boys JV & varsity boys tennis will host Elkhart Memorial at 5:30 p.m.
Our player, Mitch Rose (Plymouth), and the opposing player, Ryan Harmelink (Goshen) were in a #1Singles battle in the third set, that would ultimately decide a 3-2 match (that Goshen would end up winning). Mitch began to cramp at 1-1 in the third set. Both Ryan, and his coach Daniel Love, expressed concern for Mitch when he started cramping, and gave him extra time to originally address the issue when it happened, and to later receive treatment for it. Their patience and compassion were much appreciated. Thank you to Coach Love and Athletic Director Larry Kissinger for teaching our GHS athletes good sportsmanship. And thank you to Ryan Harmelink for being a great student athlete and an outstanding representative for Goshen Community Schools. The GHS cafeteria is offering free after school snacks every day after school. This program is for any student who is staying after school. All student-athletes, club members, music participants, drama participants, after school homework help kids, etc. are strongly encouraged to stop by the cafeteria after school and take advantage of this generous opportunity. Students just need to show their ID and they can grab a healthy snack to go that will hold them over during their after school activities until dinner. The cafeteria will stay open until 3:50 p.m. to hand out the snacks. All students picking up the healthy snack after school will need to eat their snack in the cafeteria. We appreciate your cooperation with this adjustment that is mandated by the state of Indiana in order to continue this program. Any person interested in participating in softball this spring needs to have their physical and concussion paper work turned in before attending Skill Development Workouts. All workouts are on Mondays and Wednesdays at Shanklin Park from 4:00-6:00 p.m. These are for all athletes that are not in a Fall Sport. If you have any questions please see Coach Kulp in room 1070. The GHS athletic department is hosting a Red Cross Blood Drive TOMORROW in the cafeteria from 8:00 a.m.-1:00 p.m. Any students interested in helping can sign up for a two hour time slot between 7:30 a.m. and 1:30 p.m. This service would certainly qualify for volunteer hours you may need for any of your clubs or organizations. See Mrs. Schrock in the athletic department to sign up to help with the event. We are not asking you to sign up to give blood! Stay in Bounds Ambassadors are junior and senior student-athletes who visit a 4th grade classroom six times a year to teach character principles through games and stories. All returning seniors should notify Mr. Kissinger if you are not able to participate again this year. Juniors are encouraged to see Mr. Kissinger during Monday lunches in the commons to let him know if you are interested or stop by the athletic office to leave a message. This is a time commitment of approximately 1.5 SRT periods per month, but a very rewarding experience. Please consider finding out more by attending an SRT meeting during the 2nd session of SRT on Tuesday, September 18th. This session is for juniors or new seniors interested. The boys varsity soccer team hosted the Northwood Panthers, and won with a score of 5-0. Goals: Ciro Aguilar (2), Saulo Luna (1), Ricardo Garcia (1), and Fernando Quevedo (1). Assists: Fernando Quevedo. The win puts the boys varsity soccer team’s overall record at 7-3-1 and 2-2-1 in the NLC. Boys tennis beat Plymouth in a hard-fought match. Wes Beck won the last nine games at 2 singles and Carlos Lichty overcame 3-game deficits twice at 3 Singles. 1 & 2 Doubles dropped 3-setters but Ryan Harmelink at 1 Singles closed out his 3-set win to clinch the win for the RedHawks. They are now 5-1 in the NLC and host Memorial on Monday for Senior Night. Don Perry, Zach Barker, and Andy Eby each got wins in the JV match. The girls soccer team lost to Northwood last night 4-2. Aniya Hartzler and Alex Lozano scored for the RedHawks. Maggie Gallagher and Hailey Mast assisted on the goals. Goshen’s JV team remained undefeated with a 2-1 victory over Northwood. Maddie Swallow and Alex Lozano scored for the RedHawks. Priscilla Ramirez had one assist for the RedHawks. The Goshen girls are off this weekend and host South Bend St. Joe on Monday for both staff and middle school night. The JV game starts at 5:00 p.m., followed by the varsity at 6:45 p.m. Boys JV soccer defeated Northwood 2-0. Goshen goal scorers: Isaac Daniels and Moises Gutierrez. Goshen assists: Isaac Sensenig. Boys varsity football will play at Concord at 7:00 p.m. Girls varsity golf sectionals will be held at Cobblestone Golf Course in Kendallville – time TBA. Boys JV soccer will host the Goshen Invitational at 9:00 a.m. Boys JV tennis will compete in the Wawasee Invite at 9:00 a.m. Girls varsity volleyball will host the Goshen Invitational at 9:30 a.m. Boys and girls JV & varsity cross country will compete in the West Noble Invitational at 9:30 a.m. Boys varsity tennis will compete in the LaPorte-Reed Invitational at 10:00 a.m. Boys JV football will host Concord at 10:00 a.m.
Parent/Teacher Conferences are scheduled for TODAY from 4:00-8:00 p.m. in the cafeteria and commons area. The conferences will be arena style. Parents and guardians will receive progress reports during the conferences. The bookkeeper will also be available for textbook rental payments. DUE TO PARENT/TEACHER CONFERENCES TODAY, AFTER SCHOOL SNACKS WILL BE GIVEN OUT FROM THE ATHLETIC CONCESSION STAND BY THE MAIN GYM. – The GHS cafeteria is offering free after school snacks every day after school. This program is for any student who is staying after school. All student-athletes, club members, music participants, drama participants, after school homework help kids, etc. are strongly encouraged to stop by the cafeteria after school and take advantage of this generous opportunity. Students just need to show their ID and they can grab a healthy snack to go that will hold them over during their after school activities until dinner. The cafeteria will stay open until 3:50 p.m. to hand out the snacks. All students picking up the healthy snack after school will need to eat their snack in the cafeteria. We appreciate your cooperation with this adjustment that is mandated by the state of Indiana in order to continue this program. WE WILL NOT HAVE THIS TODAY DUE TO PARENT/TEACHER CONFERENCES. -Homework help is available every Tuesday and Thursday in the media center from 3:45-5:00 p.m. You must be in the media center by 3:50 p.m. in order to stay for this, and dismissal times are at 4:30 p.m. and 5:00 p.m. You are expected to exit the building through door FF, which is located by the stairs just down from the media center. A bus will be available around 5:10 p.m. if you need a ride home. This bus is for students who stay for after-hours help ONLY. It will pick you up at the south end of circle drive by the flag pole. This is a great opportunity if you just need a little extra time or even just a quiet place to do your homework at the end of the day. Friday night’s football theme is Pajama night! Come support the RedHawks at Concord! Game time is 7:00 p.m.
On Saturday, September 15th the GHS athletic department is hosting a Red Cross Blood Drive in the cafeteria from 8:00 a.m.-1:00 p.m. Any students interested in helping can sign up for a two hour time slot between 7:30 a.m. and 1:30 p.m. This service would certainly qualify for volunteer hours you may need for any of your clubs or organizations. See Mrs. Schrock in the athletic department to sign up to help with the event. We are not asking you to sign up to give blood! 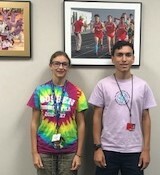 Student Athletic Council is the group at GHS which supports unified sports, fan appreciation nights, greets at awards programs, and is the student government for the athletic department. All current sophomores, juniors, and seniors who will be on an athletic team during this school year, are encouraged to join. The first meeting is TODAY during the 2nd session of SRT in the main gym. We will be finalizing the RedHawk Sportsmanship posters for each GHS athletic venue, participating in a group leadership activity, eating cookies, and developing a pros and cons list for Goshen athletics to help us plan on projects for the next two years. Please join us in the main gym on Thursday! Do you want to have a voice in issues that impact our city? Do you want to make a real, positive change in our community? Join the GHS Youth Caucus! The Youth Caucus is a group that will meet and discuss city wide issues, and use city resources to benefit Goshen as a city. The first meeting will be TODAY during the 1st session of SRT in the main gym. All are welcome! LGBTQ? Questioning? Ally? Join GSA! Genders & Sexualities Alliance is an inclusive club focused on activism and empowerment, in addition to being a safe place for people to talk about (and be!) their real selves. For more info, follow the link: https://sites.google.com/staff.goshenschools.org/gsa/ Our first meeting is TODAY during the 2nd session of SRT in room 3200. Art Club begins TODAY during the 2nd session of SRT in room 1450. Come for a fun time! This year our first or second project is finishing a mural in Whiteman. The GHS Book Club will meet TODAY during the 2nd session of SRT in room 3180. If you are interested in reading and in seeing what this club is all about, you are invited. If you cannot attend, please contact Mr. De Kleine in room 3180 or by e-mail. Boys soccer will host Northwood. JV plays at 5:00 p.m., followed by varsity at 6:45 p.m. Girls freshman volleyball will travel to Penn to play against Northridge and Penn at 5:00 p.m. Boys JV & varsity boys tennis will play at Plymouth at 5:30 p.m. Girls soccer will travel to Northwood. JV plays at 5:30 p.m., followed by varsity at 7:15 p.m. Girls volleyball will play at Northridge. JV plays at 5:30 p.m., followed by varsity at 7:00 p.m.